Starpath has made a custom link that is easy to remember that takes you to the place you can download free echarts in either vector format (called ENC for electronic navigation chart) or in the more accustomed graphic format (RNC for raster navigation chart, which are exact images of the paper charts). If you are new to echarts you might not have a program to view these with, but there are numerous options available. 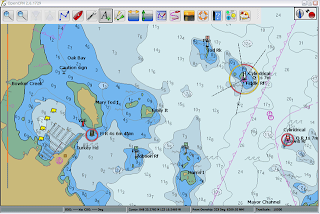 Also even if you do not intend to use ECS (electronic charting system) for your own primary navigation, these days it is only prudent to have all the charts you might ever need at hand as a back up. Not to mention that even not using them for primary underway navigation, they are still the best way to layout a route, and then transfer it to your active GPS. Below is the list that NOAA has. There is no significance to the order they use, nor are there any standards for getting onto this list. They also stress that being on the list is not an endorsement of any kind, which we too have to repeat here. Some of these are indeed free and others just demos that time out quickly; some are for PC only and some for Mac only, some for both. Some show RNC only, others both RNC and ENC. NOAA also presents this list for Mobile readers, but this is even rather more of a black box, as this industry is changing rapidly. Their list is just a fraction of readers, and the functionality is very diverse. 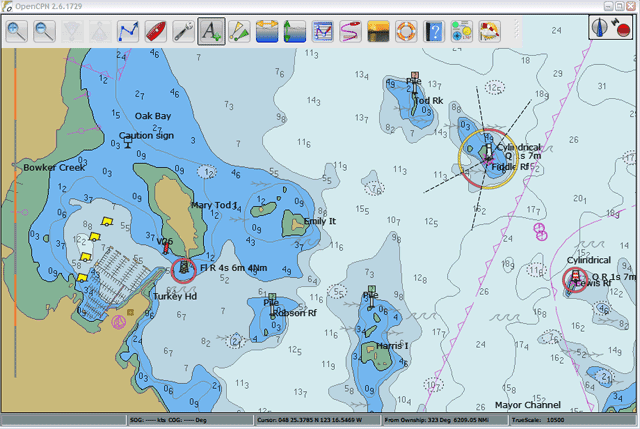 Nevertheless, this remains a very exciting and promising aspect of modern marine navigation. There is also this list and note at NOAA, which is directed toward ENC software, but there is no reference to free or demo, and we stress that the RNC format is the safest and easiest to use, at least for some time now. "The following corporations/organizations offer a number of charting related products that may provide useful important information. This listing is provided as a public service for information only and neither the Office of Coast Survey nor the Government endorse any of the products or services provided by these corporations/organizations. Please note the links connect to Web pages outside of the Office of Coast Survey Web site."